The Bravo Company Gunfighter Compensator for AR-15s in 5.56mm is a combination of a compensator and flash hider. The combination of the tuned slots on the side and interior cone offer recoil mitigation, muzzle-rise compensation and flash reduction. The dual action brake minimizes the side pressure and is designed to have less noise than typical compensators. 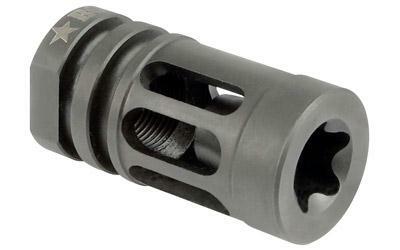 The BCM Gunfighter Compensator is compatible with A2 mounted suppressors. Includes crush washer. Predrilled hole at the base for permanent installation. Made in the USA! The Mod0 is made for 16" barrels. The Mod1 is made for 14" barrel that needs to be 16" overall length.